"It's the whole body of the work that is to be applauded"
Recorded: Yellow 2, Stockport; Abbey Road, London; Square One, Bury mid-1986. Following a US tour in February-March 1986, Karl Burns left the group for the second (although by no means the last) time. Simon Ford suggests that the reason was the drummer’s new relationship with Carrie Lawson1 (Marc Riley could certainly attest to MES’s antagonism to group members’ other halves) but there were wider issues involved, perhaps primarily Burns’ refusal to be intimidated by Smith and accept his dictatorial tendencies. His replacement, for example, had noted ‘a massive slanging match’2 between the two of them on tour in early 1986. His first Fall gig was in Folkestone on 5 June 1986; his first recording for the group was Hey! Luciani (‘all I did was hit this floor tom for eight bars’6). He also played with the group on their tenth Peel session on 29 June (broadcast on 9 July), performing Hot Aftershave Bop, R.O.D., Gross Chapel-GB Grenadiers and U.S. 80’s-90’s. On the 7 July, the group released the single Living Too Late. In a Sounds interview published a couple of weeks after the single’s release7 MES commented that ‘You get tired, really tired… I’m psyching myself up all the time for these live concerts and a lot of it is going through the ceiling’. This sense of jaded exhaustion was certainly reflected in the song. Smith’s tale of middle-aged regret and ennui (‘Sometimes life is like a new bar: plastic seats, beer below par, food with no taste, music grates…’) is, however, a touching, depressing masterpiece. The loping bass, stodgy drumbeat, ghostly violin and gently echoing guitar create a melancholy atmosphere that match the embittered, wistful lyrics perfectly; the relentless, marching rhythm a perfect companion to the image of a life stuck in a rut. Living Too Long (the lengthier version on the 12″), places a nervy, skittering guitar front and centre, adds steam-locomotive percussion and has MES’s vocals floating around more subtly in a tinny, megaphone style. It’s excellent in its own right, but it’s the more concise Living Too Late that’s the thing of absolute wonder. 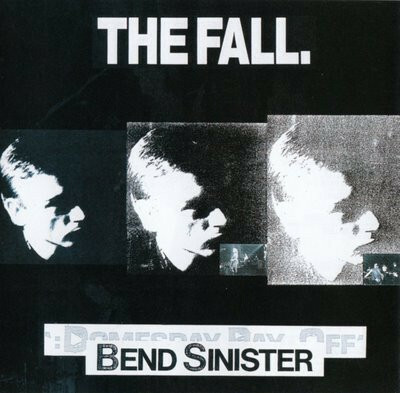 I’d be perfectly happy with four and half minutes of just the relentless main section, but who else but The Fall would have added the middle eight (chorus?) that comes in at 1:06 and 2:31? A strange, ascending, discordant kaleidoscope over which Smith contributes a preposterous falsetto that’s at once laughable and oddly moving. The bouncing staccato bass that SH uses to bring us back into the main body of the song (e.g. at 1:21) is one the most memorable moments in the whole back catalogue. Living Too Late was played 53 times 1986-87; once again the group only just dented the top 100, the single reaching number 97. The b-side was Hot Aftershave Bop. It’s a shame that this is buried away here, as it’s a strong track. Steve Hanley’s contribution is a highlight: not the most complex of bass lines, but it forms a prominent, driving foundation, and there are several flamboyant slides up the neck (e.g. at 2:00 and 2:06) that add a bit of colour. There’s a guitar in either channel; the left (Brix?) focusing on relatively straightforward chords/arpeggios, whilst the right (Scanlon, presumably) lets loose with some frenetic, blues-rock string-bending. The drums are the song’s Achilles heel, though: whilst they gain a bit more body from around the two minute mark, the fragile, tinny snare in the first half makes the song feel a little thin in places. It was played 45 times 1986-88. Two months later, the group followed this up with Mr. Pharmacist, which fared a little better commercially, reaching number 75 (see the album tracks below). The b-side, Lucifer Over Lancashire, is an engaging piece of rickety rockabilly racket. The verse is particularly pleasing, with MES getting all high-pitched and ‘yee-haw’ while the band rattle along like a train. The chorus, despite Hanley’s impressively fuzzy, throbbing bass, is a bit dull and obvious in comparison to the rest of the song, however. It was played 73 times 1986-89. Tucked away on the 12″ was Auto Tech Pilot. Never played live, it’s an oft-overlooked little gem. The gloomy descending bass line, echoey piano and fuzzy understated guitar give it a sparse, ghostly atmosphere. It also has a somewhat chaotic feel, particularly in the slightly jarring transitions/tempo changes, and is one those Fall songs where the group sound as though they’re working hard to hold things together. There’s an excellent, detailed review of the track by hippriestess here. UK unemployment was still on the rise: figures for July showed it to be nearly 3.3 million. In education, the GCSE replaced ‘O’ levels. The Independent (‘It is. Are you?’) was launched and Gateshead’s Metro Centre became the largest shopping centre in Europe. In music, The Communards’ Don’t Leave Me This Way (the best-selling single of the year) was in the middle of a month-long stay at the top of the UK singles chart, having replaced the soporific lovers’ rock of Boris Gardiner’s I Wanna Wake Up With You. Five Star’s Silk & Steel was number one in the album charts, but was only there for one week, soon to be ousted by the multi-million selling Graceland. The 1986 Brit awards paint a picture of a rather moribund UK music scene: Phil Collins won best male solo artist and best album (for No Jacket Required), Dire Straits were best British group and the ‘breakthrough act’ was Go West. Best international group was Huey Lewis and the News. The group embarked on a 22-date UK tour to promote TNSG in the Autumn of 1985. Dktr Faustus was debuted on the first date (Newcastle Riverside on 3 October) and appeared on the majority of the tour. 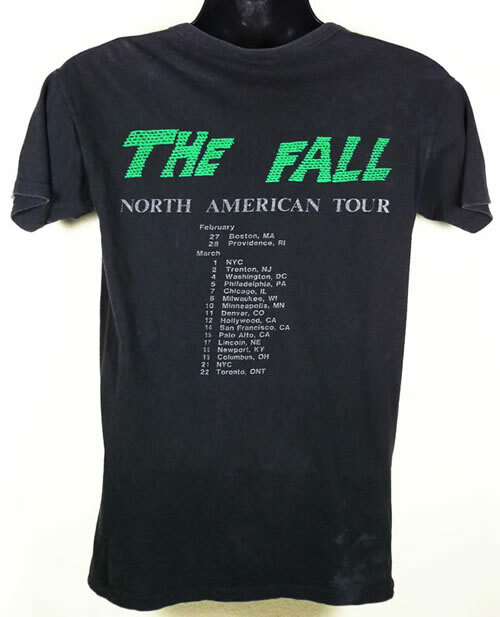 They played a further seven UK dates in February 1986. Hey! Luciani and Hot Aftershave Bop were debuted on 6 February (where Paul Hanley stepped in in place of Karl Burns). Rowche Rumble, after a five year absence, was played at six of these gigs; it also featured in most of the nine-date North American tour that took place in February-March. At the majority of the North American gigs, the group opened with Countdown, a lively if slight instrumental that can be heard on The Fall Box Set. On the 1 March in New York, Living Too Late was played for the first time; Bournemouth Runner, US 80’s 90’s and R.O.D. followed a few days later in Washington. Simon Wolstencroft’s first gig in Folkestone on 5 June saw Gross Chapel – British Grenadiers, Lucifer Over Lancashire and Riddler! get their first outings. On the 11th, in Slough, Mr. Pharmacist was played for the first time; Terry Waite Sez followed on the next night in London. For the third (and final) time, John Leckie was the producer. However, unlike on Wonderful and Frightening, where he had subtly and successfully suggested changes to the group’s usual approaches, and TNSG, where even MES had to admit he captured The Fall sound perfectly, the Smith-Leckie relationship here was fraught and volatile. Perhaps it was due to Smith’s well-documented desire to throw a spanner in the works whenever he felt things were getting too comfortable at the expense of creative tension; maybe it was due (as Brix suggests8) to a combination of MES’s heavy drinking and the first signs of marital problems. Either way, the deterioration in the Smith-Leckie relationship seems to have had an influence on the album’s sound – Smith, for example, apparently insisting that some tracks be mastered directly from a bog-standard C909. Brix described the whole experience as ‘miserable’10. Reviews were much less positive than had been the case with the last couple of albums. In the NME, Dave Haslam regretted the lack of ‘eyeball-to-eyeball social comment, now replaced by more occasional contributions; pithy, scratchy phrases delivered in so clotted a vocal style that they undermine any potential accessibility in the music’. He still felt that group sounded ‘a good deal better than the rest’, but also that ‘you don’t feel the hard edges, the bite and the snarl you would have felt from their early releases’. 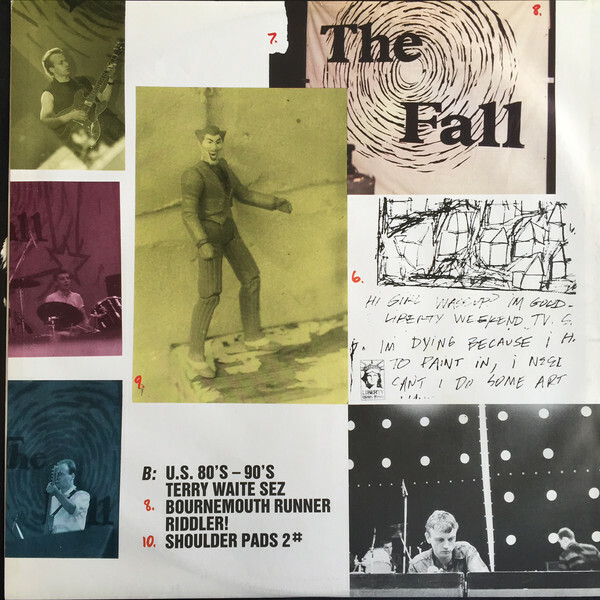 According to Melody Maker‘s Simon Reynolds, ‘While The Fall’s music has grown steadily more vivacious and approachable, Smith’s writing has folded in on itself in an ever denser scrawl, beyond decipherment, let alone understanding’. Despite this, Bend Sinister achieved a far higher chart placing than all the previous albums, reaching number 36. You can often argue that the sequencing of Fall albums is somewhat perverse, but R.O.D. (‘Realm of Dusk’) is clearly a great choice as an album opener. One of Brix’s particularly sprightly riffs sits atop a song full of brooding darkness (‘I added the California beach to the dark dimension’11) to great effect. A disturbing yet poetic set of opening lines too: ‘It’s approaching / 600 pounds gas and flesh / Rotten, tainted / It’s approaching, lips and tongue abhorrent / Flickering lexicon or a stray dog pack leader.’ It was played live 40 times. First recorded the year before the album’s release as part of the ninth Peel session (as Faust Banana), Dktr. 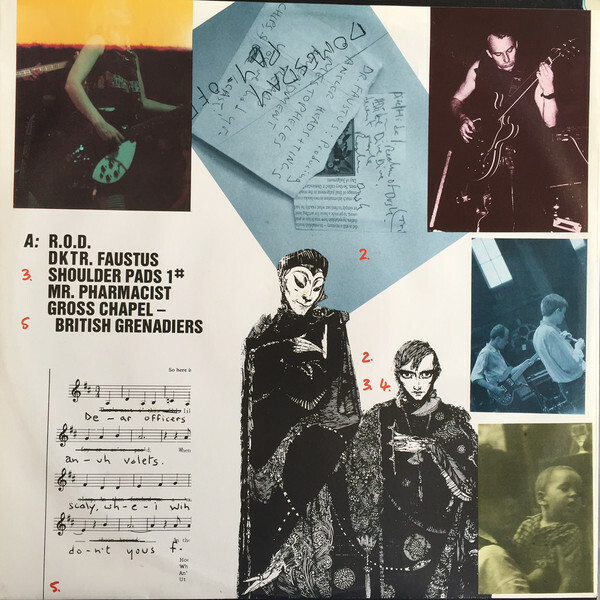 Faustus was played 48 times 1985-87. 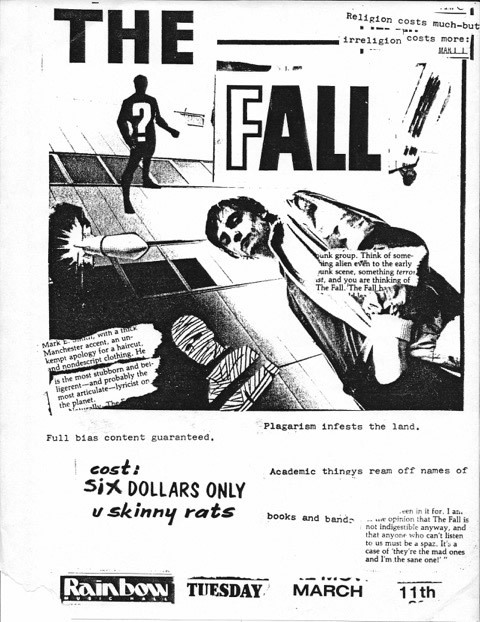 To the casual Fall listener familiar with the group’s most famous period, it’s probably as close to an ‘archetypal’ Fall song as you get, with a twangy, repetitive guitar riff and a notable contrast between MES’s ‘megaphone’ vocals and Brix’s American drawl. For me, it’s also one of the best examples of how the Smiths’ vocals worked well together. Based (obviously) on the Faust legend, there’s an interesting and detailed discussion regarding the song’s lyrics here. Brix disliked the song: ‘I cringe when I hear it. I hated having to say those stupid lyrics’12. A flimsy, throwaway tune most notable for its cheesy keyboard line (which bears a passing resemblance to the theme tune of dreadful 70s-80s sitcom Are You Being Served?). Difficult to see how this could ever have been selected for the album over Auto Tech Pilot or Hot Aftershave Bop. Played live 50 times. By some distance the group’s most often played song (around 400 performances between 1986 and 2017), it’s a cover of late-60s Californian garage-rock band The Other Half‘s 1966 single which featured on one of the Nuggets compilations. The bare-bones bouncing riff and mosh-friendly uptempo sections make it easy to see why it was a live favourite, although it’s never clear to me why this particular track was revisited by the group quite so often. It’s a spirited and enjoyable thrash, although I have to confess that I prefer the original. A masterclass in the subtle creation of mood and tension. Steve Hanley rumbles along ominously; one guitar picks out a dark yet delicate and brittle melody line while the other scratches out oblique, angular chords; the drums are at once forceful yet carefully restrained. There’s a sense throughout that each element shifts slightly, moves to a different beat, which creates an unnerving, dislocated feeling. MES’s vocals are almost buried, providing texture as much as a focal point. The whole thing sounds like it’s going to erupt at any time, but – like, say, Hip Priest – the group avoid any crescendo-ish clichés. As the song beds down around the six minute mark, you almost want it to burst free and thrash it out; the fact that it doesn’t is testament to their disregard for rock tropes and their understanding of effective dynamics. (You can find an excellent, detailed analysis of the song here.) It only had a nine month stint on the setlist, its 29th and final performance occurring in February 1987. The opening drums (both in terms of sound and pattern) root this track firmly in the 80s. It’s an unusual hybrid, containing electro/hip-hop influences as well as having a psych-rock flavour (especially the skittering synth effects); as if Run DMC had teamed up with Hawkwind rather than Aerosmith. It’s one of those tracks that the group didn’t quite capture at its best in the studio, good as it is; the Peel session and several live versions (see here) are far better. 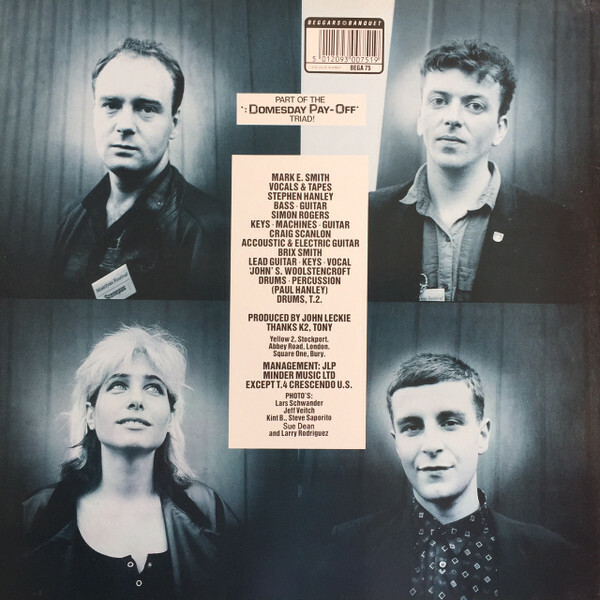 According to Brix13, the song was inspired by the group’s on-tour experiences at American customs, where they were questioned about some sleeping pills that Brix’s mother had given them: ‘we practically had stickers on our foreheads saying “search me”.’ It came in at number ten in the 1986 Peel Festive 50, and enjoyed a long stint on the setlist: 123 appearances 1986-97. Another one of Brix’s lively, twangy riffs. Its brevity (99 seconds) is welcome, as although it’s pleasant enough, it’s too flimsy to have been sustained for any longer. Played 56 times 1986-87. You could never accuse MES of having a limited scope in terms of lyrical subject matter, but here, ‘a bloke nicked our banner at a gig once’ (the story is here) is not exactly a rich seam for lyrical insights. It’s a curious little song: it starts off with a slow, doom-ish bass line and echoey vocals that seem designed to create a dark and mysterious atmosphere. It’s not entirely successful though, as the band’s timing seems curiously hesitant. Once it gets uptempo, it all feels a bit unsubstantial and unconvincing. The Rock Lobster style keyboards don’t help either. It feels like it would have made a satisfactory if unremarkable b-side; as 6 minutes of a 46 minute album it doesn’t really stand up to scrutiny. It only got 16 outings 1986-87. An intriguing little number, built around a ponderous and simplistic (and once again rather twangy) guitar line that periodically bursts into a bit of energetic rocking out. Lots of interesting noises going on in the background too. Several sources indicate that ‘riddler’ was something that MES and his friends, as kids, used to shout randomly at people. It only had an eight month stay on the setlist, its 31st and final performance coming in February 1987. A brief and pointless reprise. The frantic, scratchy guitar adds a little interest, and Steve Hanley’s bass booms impressively, but overall it’s just filler. One was more than enough. At the time of release, the CD and cassette versions contained three bonus tracks: Living Too Late (a crying shame it wasn’t on the ‘proper’ album), Auto-Tech Pilot (ditto) and Town And Country Hobgoblins – a cunningly-renamed live recording of City Hobgoblins from the Town And Country Club, 12 July 1986. 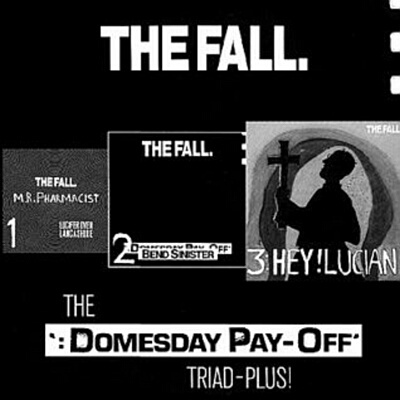 In 1987, the album was released in the US as The Domesday Pay-Off Triad Plus. The tracklist was: There’s A Ghost In My House / U.S. 80’s-90’s / Shoulder Pads #1 / Mr Pharmacist / Riddler! / Hey Luciani / Haf Found Bormann / Terry Waite Sez / R.O.D. / Shoulder Pads #2 / Gross Chapel-British Grenadiers. In 2019, the album got a major reissue, which included a remastered version of the album plus singles, b-sides, etc. The remastered versions are, almost without exception, a great improvement, adding an exciting sharpness and brightness. Not without its moments of greatness, it’s an album that falls a little flat in comparison to what went before. It’s not just the original production (which gives it a flat, almost ‘cold’ sound) but the quality of songs overall falls short of those on Wonderful and TNSG. I listened to it a lot at the time, but it has gradually receded from my listening over the years. It, to me, is one of those where you pick out moments without being inclined to listen regularly to it in its entirety. It will upset some, I know, but I got more consistent enjoyment from Room To Live (and all of those above it) than I did from Bend Sinister. 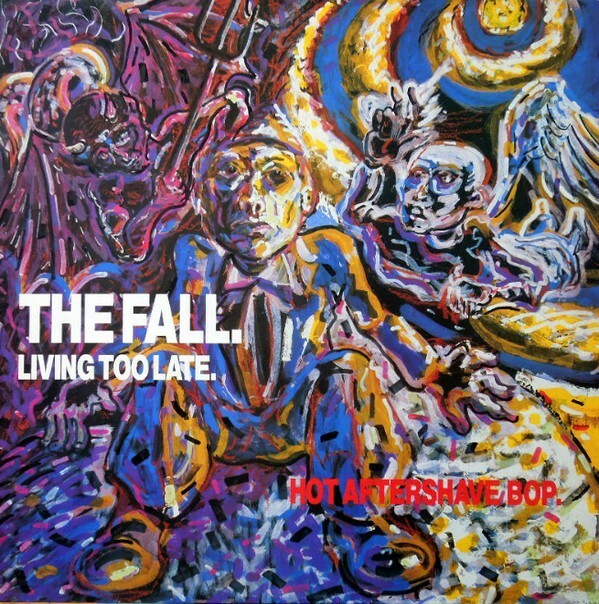 As far as singles go, Living Too Late leaps to the top as one of my favourite ever Fall songs. 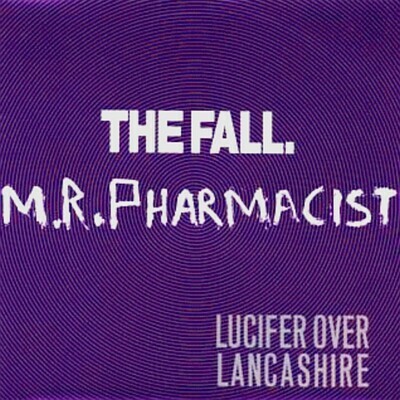 Mr. Pharmacist is solid enough and finds itself mid-table. It’s not really worthy of description or review, to be honest; the very definition of scraping the bottom of the barrel. Excellent as ever, thanks for this. Have to say that up until very recently, I concurred with everything here and really didn’t rate BS as an album. The remaster has changed all that. It’s like listening to a new album and, along with the non-album tracks, feels far more essential than it used to.